You can count on me to give you an incredible tour from a locals perspective of Antigua! One of my greatest passions is to go out and try the exceptional and authentic foods in the city, so I know just where to take you. I understnad, it can be overwheleming when visiting a city to know where the best resturuants, bars and cafes are at, so that is why I have expertly designed this tour to take you to the most genuine foodie spots in Antigua. 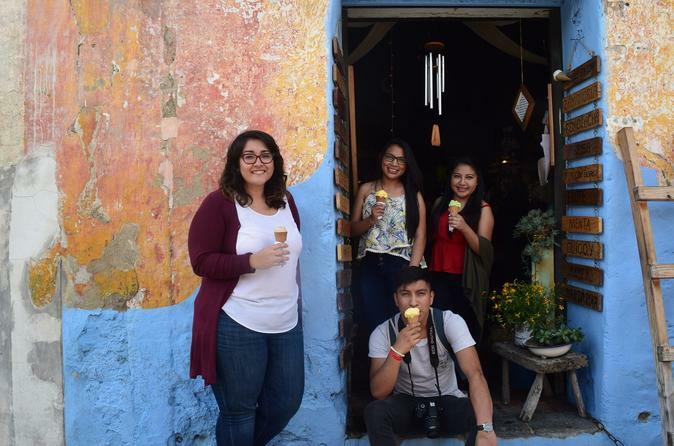 We will walk all throughout the historical center of town and the local market, stopping every 10-15 minutes to eat and drink traditonal Guatemalan food. We will be sampling various antojitos, which are small snacks to satisfy those "little cravings" we all get. We will also be sampling locally made ice cream from my favorite ice cream shop that uses pure ingredients and offers fun flavors for those who are looking for something different than your standard chocolate and vanilla! As we explore the histroical city center of town and local market, I will be sharing with you important information about the city that tourists would not ever know without the help of a local guide. Many buidlings and streets are recognized by UNESCO as World Heritage Sites, so there is much to be discovered with me on your travels to Antigua.